Looking for a hotel in Fes? An extraordinary two-story antique royal suite, encrusted with museum-quality carved plaster, original mosaic and decorative painting. Authentic and spectacular. Lonely Planet ranked it in Top 5 Author’s Picks of best places to stay in Fes; Frances Mayes called the massriya “an arranged marriage of art and geometry”; and Conde Nast Traveller magazine says it’s "the Medina apartment to rent." This small house has lovely examples of carved plaster and painted wood, and, rare for a real Fassi house, is small enough to be ideal for 4 people. A spacious ground-floor kitchen makes this a wonderful house for a family or two couples. Meticulously restored and decorated with antique textiles. This tall house reaches skyward toward the best panoramic view of the medina of any house we offer. The ground-floor courtyard features a gazing pool, a wonderful small kitchen and a stunningly ornate wall fountain. Three large suites, each with imaginative private baths. At the heart of this Riyad is a dramatically-lit central garden courtyard, where the calming sound of falling water from the marble fountain fills the shadows under the orange trees. 85 Euros/night for 2 people. Add 20 Euros/night for each additional person. A 20 Euro/night additional charge for the Fes Festival (around the first two weeks of June) and for the winter holiday and New Year period. Heat in all rooms. Air-Conditioning in upstairs bedrooms. The Dar Ben Safi is a lovely traditional Dar with a courtyard spectacularly tiled in blue and white tiles, with intricate mosaics extending up the walls of the courtyard. Twin salons look onto the courtyard through tall keyhole cedar doors capped by intricately-carved plaster. An inset niche forms a wonderful sitting area in the courtyard. 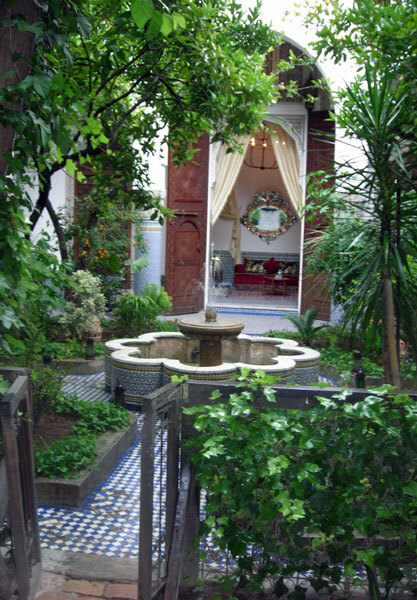 Dar Jnane is a lovely and simple small 18th century traditional house—built around a central courtyard filled with light. Dar Jnane's terrace has an amazing panoramic view to the south and east and Fes and a wonderful kitchen off the courtyard.